This Four Winds Super C diesel motor home provides power and luxury, plus several "must have" features you will want as you travel the countryside. The chef in the family can make meals on the cooktop, in the oven or in the convection microwave when you both get tired of eating out. The residential refrigerator also has an ice maker which is quiet convenient during the summer months. The kitchen also includes a pop-up outlet, a waste basket, and a space prepped for a washer and dryer if you choose to add those appliances for your longer trips. The private walk-through bedroom offers you a queen bed slide out, closets and a TV, plus easy access to the rear full bathroom. You will find sleeping space for five other guests on the sofa bed, Dream dinette and cab-over bunk. The guests can use the half bath. 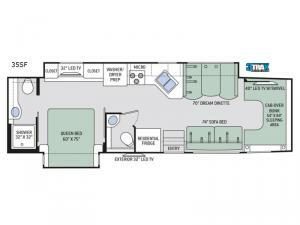 Come see what else will make this the perfect RV for your lifestyle. 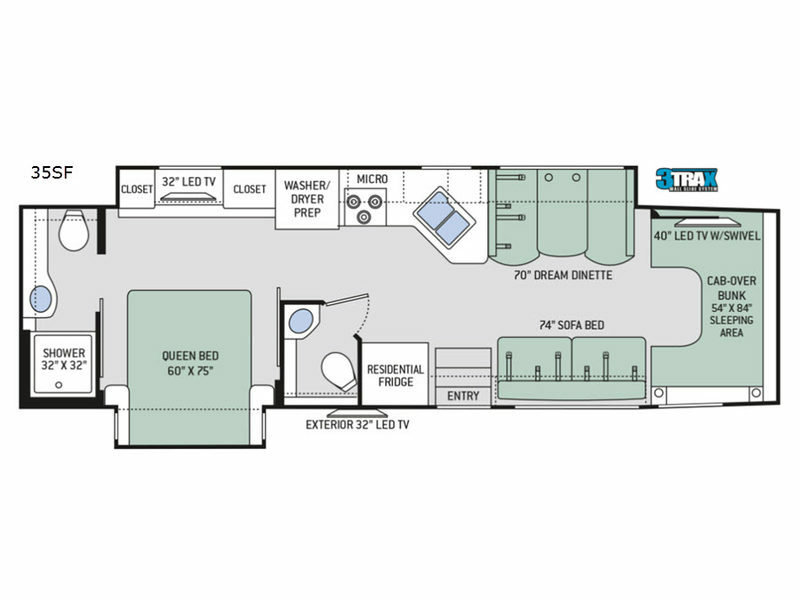 Each Four Winds Super C diesel motor home by Thor Motor Coach offers an extra-large living area so you can take along more family members and/or entertain other RVers at the campground. You will also find residential vinyl flooring for easy clean up, high-gloss glazed cabinetry with solid wood raised panel cabinet doors, hidden hinges and Nickel finish hardware, plus Leatherette furniture for a luxurious style. If you are looking for a powerful ride with strength and towing capacity including inside comforts, choose your favorite Four Winds Super C today!